These deep-fried squid fritters are great appetizers and a treat for seafood fans. Cut the squid or calamari into rings. Place in a bowl with the marinade ingredients and set aside for 10 minutes. Combine the cornflour, rice flour, self-raising flour, baking powder, cayenne pepper and salt in a large sandwich bag. Add the squid rings in batches. Shake the bag to evenly coat the squid rings with flour. Heat enough oil for deep- frying in a wok over medium heat. 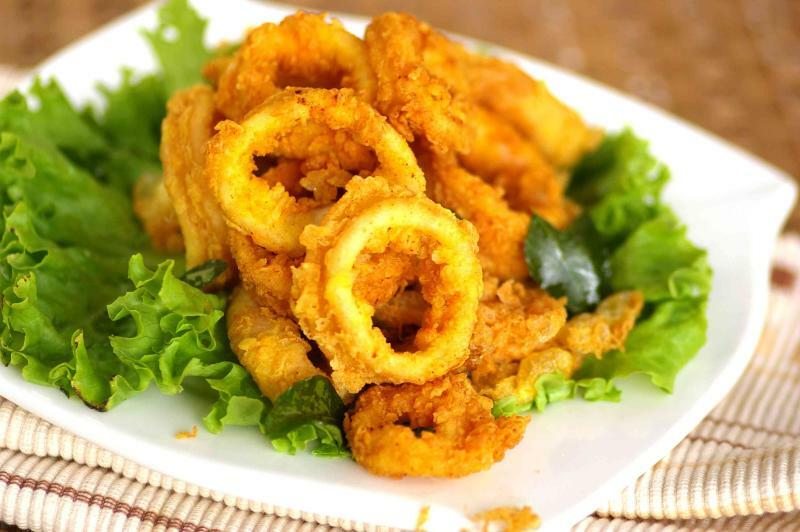 Drop the floured squid rings carefully into the hot oil and fry for 2-3 minutes until golden brown. Add in curry leaves and fry till crispy. Remove and drain on paper towels and serve hot with the dipping sauce.